[redacted] is a member of California Wing’s [redacted] Squadron. Every time I see [him] I am reminded of [former] US Congressman Dana Rohrabacher who frequently shot his mouth off supporting Russian President Vladimir Putin. This would cause my mother, who works for [redacted] here in Orange County, to sometimes shout curse words at our TV set every time Rep. Rohrabacher was on it. For reasons that would take too long to explain, my family is no fan of Vladimir Putin and no-one’s should be. Rohrabacher is a piece of work. 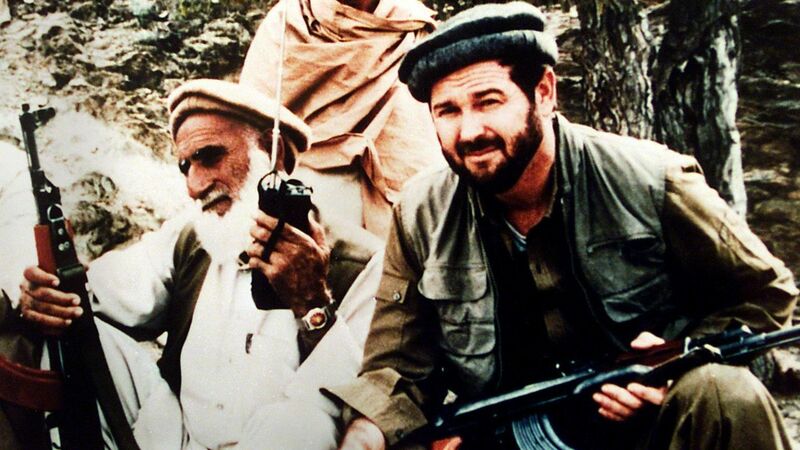 In 1988, just after he won his first election, he traveled to Afghanistan and posed for this photo. 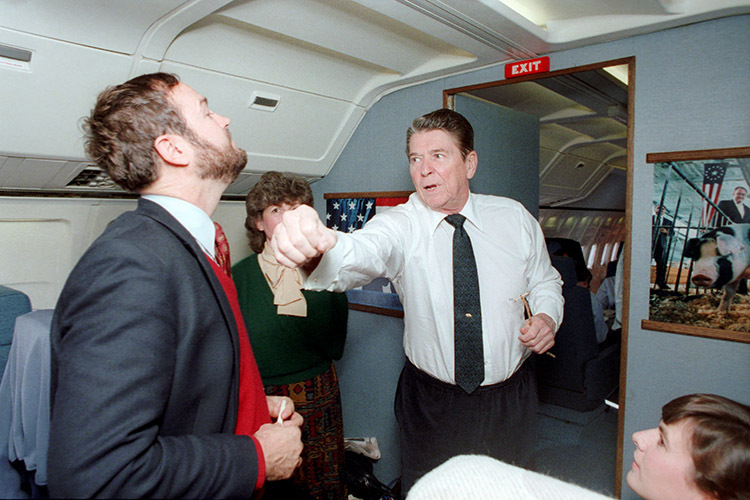 Here’s an earlier staged photo of him taking a punch from Ronald Reagan aboard Air Force One when he served as Reagan’s speech writer. Over the years, Rohrabacher has said a lot of really stupid things and you can collect them for yourself or maybe let others contribute in the comments. What I want your readers to know is that for the past twenty years Rohrabacher has been of value to the Kremlin, and the FBI had to warn him in 2012 that Russia viewed him as a source of intelligence worthy of his very own Kremlin code name. In 2013 Rohrabacher became even more valuable to Russia when he took over as Chair of the House Foreign Affairs subcommittee that oversees Russia policy. Few paid any attention to his actions and he was reelected in 2014 and again in 2016. In April 2016, Rohrabacher showed up in Moscow to accept a copy of a “confidential” memo containing accusations against Democratic donors that would reappear in Trump Tower when a Russian Lawyer Natalia V. Veselnitskaya, sat down with Donald Trump Jr. to deliver a similar document and push for relaxation of Russian sanctions under the Magnitsky Act. In 2017 Rohrabacher had dinner with Alexander Torshin, the deputy governor of the Russian central bank who is linked to Russia’s security services and organized crime. Senate investigators have an email showing that Torshin is the guy who tried to set up a “backdoor” meeting between Trump and Putin. As a member of the House Foreign Affairs Committee, Rohrabacher has advocated for better ties with Russian President Vladimir Putin. In addition to all this, it had become clear to many that Russian trolls had used Civil Air Patrol members and other dupes on Facebook to build an anti-Clinton sentiment to get Putin’s candidate installed in the White House. GOP leaders then moved to limit Rohrabacher’s power in late October of 2017. Through a senior congressional aide who requested not to be identified, we learned that House Foreign Affairs Committee Chairman Ed Royce was to be “more involved in guiding the direction” of Rohrabacher’s subcommittee that, in part, shapes U.S. policy with Russia. I’m getting tired of reviewing this with you. Feel free to add anything you want his bio. 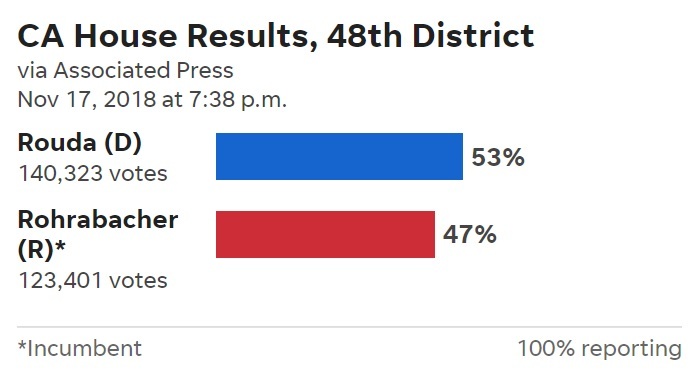 Long story short, since November 10th my family has been celebrating the fact that this 15 term, 30 year congressional vampire has finally taken the proverbial wooden stake from Harley Rouda and is finally gone. Woot!